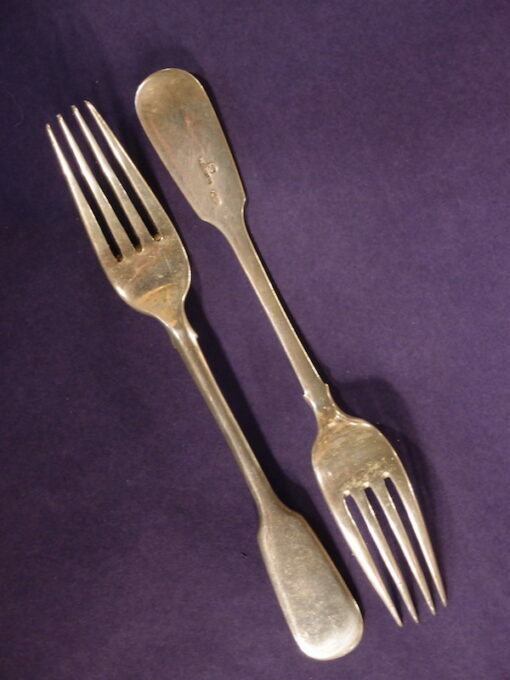 Home » Products » Imperial Russian Antiques » C1910 Pair Khlebnikov Imperial Russian Dessert Forks. Ivan Khlebnikov is one of the most prestigious Imperial period Russian silversmiths.He was a supplier to the Imperial Court, and as such, had the right to stamp his name in full on his silver as well as stamping it with the Imperial Double Headed Eagle. This is what is stamped in these two fiddle pattern dessert forks. Additionally the Kokoshnik hallmark for Moscow, 1908-1917, 84 zolotniks appears. Each fork is 16.5 cm long and the total weight is 88 grams for the two forks. Excellent lent condition.